The Spectrum Keyboard is a redesigned music keyboard intended for digital synthesizers, samplers, and other electronic media applications. It is planned as a ‘musical typewriter’, making the playing of chords and scales much easier than the old black-and-white keyboard. This is the first version (1988) of the keyboard built in New York in 1991 called the Terpstra-keyboard. 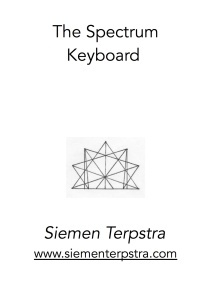 This entry was posted in 31-et, 53-et, Keyboard, Multiple Divisions on 1 December 2014 by Siemen.